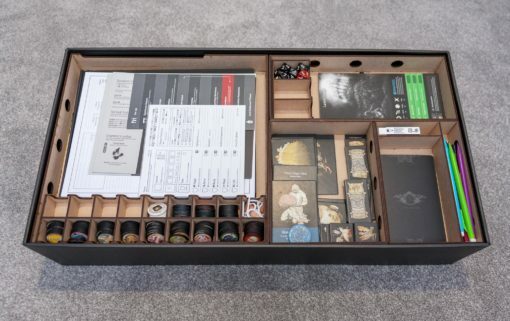 Box insert for Kingdom Death: Monster with a choice of layouts for storing different contents, and token trays for use whilst playing. 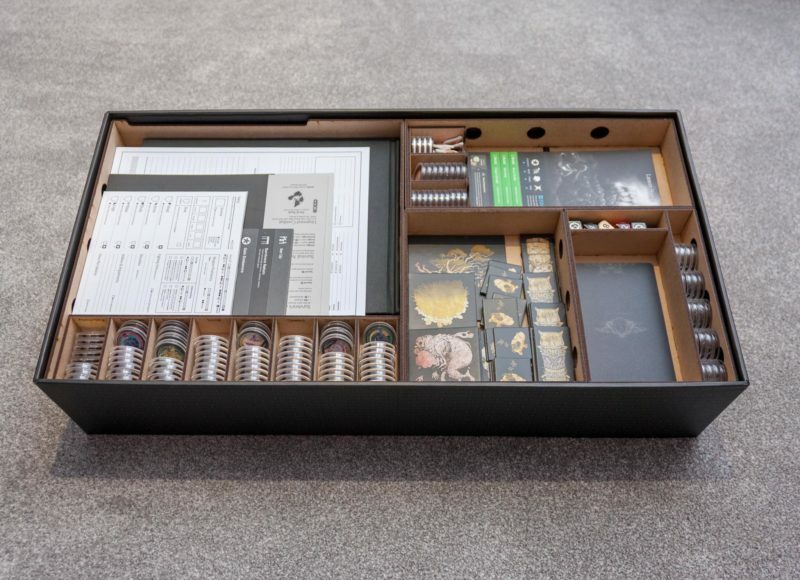 Organise you cards, tokens, paperwork, pencils and erasers with our Kingdom Death: Monster box insert. 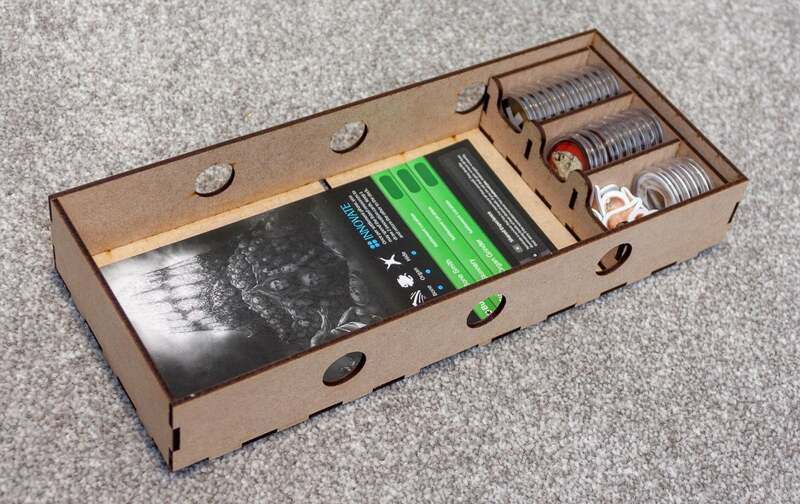 The insert was designed to store your game content as efficiently as possible, whilst also making play easier with removable trays for tokens and cards. 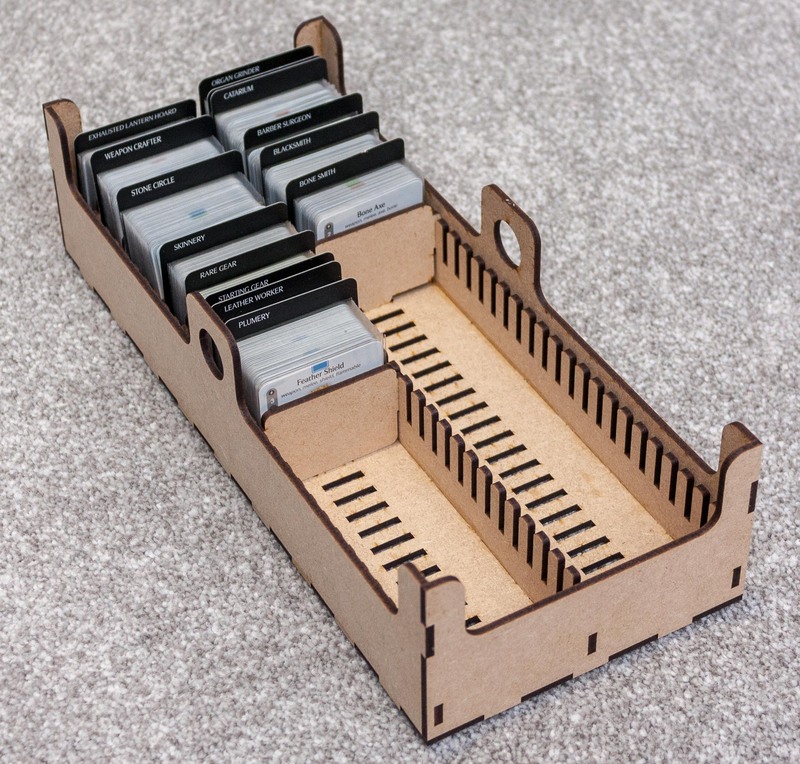 Multiple options are available to suit gamers who prefer to store their gear cards separately, or who have placed their tokens into plastic capsules. 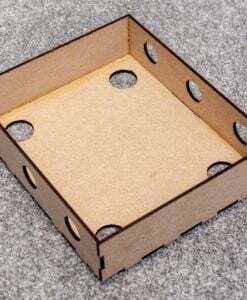 The layout of trays within the box is fixed, this allows the trays on the bottom layer to provide adequate support to the layer above, without making usage difficult. 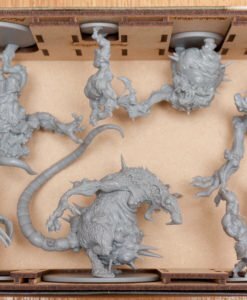 Images show Kingdom Death: Monster core game, which is not included with this product. Game contents shown is a version 1.5 Kingdom Death: Monster core game, with large cards sleeved with premium Fantasy Flight Supply sleeves, and gear cards sleeved with regular Swan Panasia sleeves. This is an unlicensed, third-party product compatible with Kingdom Death: Monster. All copyrights and trademarks are property of their respective owners. 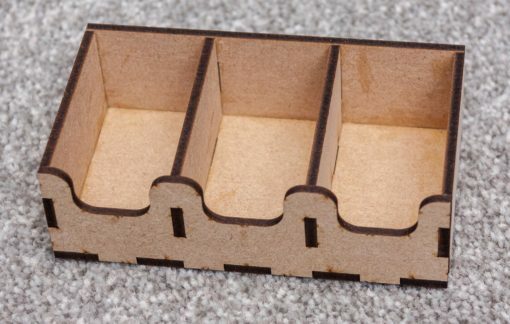 The top layer is made up of four separate trays, and two token trays. 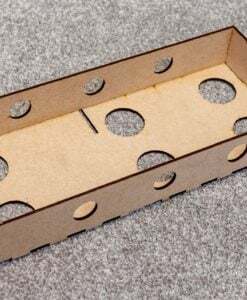 Trays have pre-cut holes in their sides to ease removal from the box, and also holes in the bottom of the trays to assist in removing their contents without turning the tray upside down! There are two options available for the top layer. Option 1 is intended for most users, option 2 however has a redesigned token tray to hold tokens in plastic capsules. 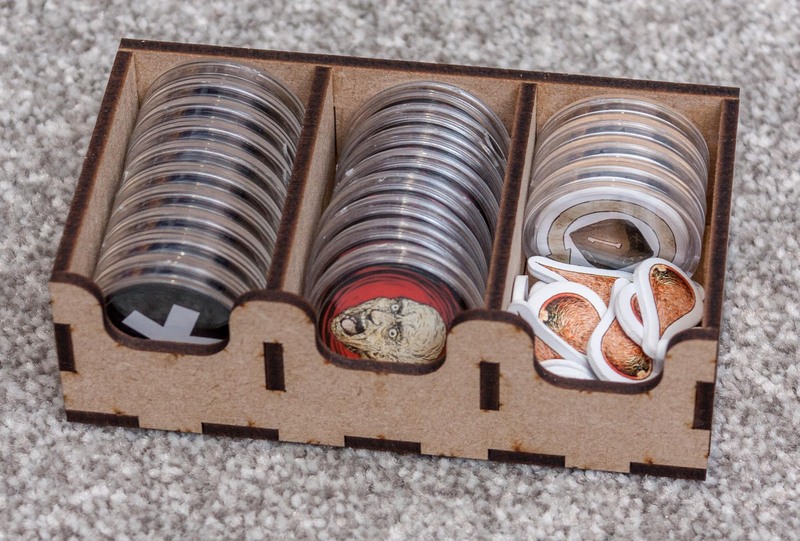 Option 1 has an 18 slot token tray for storing game play tokens. There is no engraving on the token tray. Option 2 has an 8 space token tray, for storing tokens in capsules. 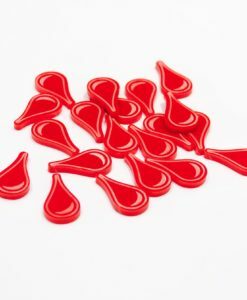 The tray is engraved to show the locations of each token. 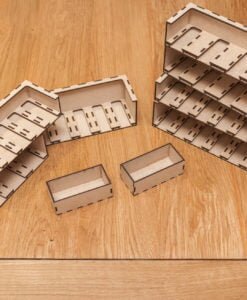 Storing tokens in capsules uses space beyond just this token tray, and as can be seen in the above images, occupies spaces that could be used for pencils, erasers, or extra dice. 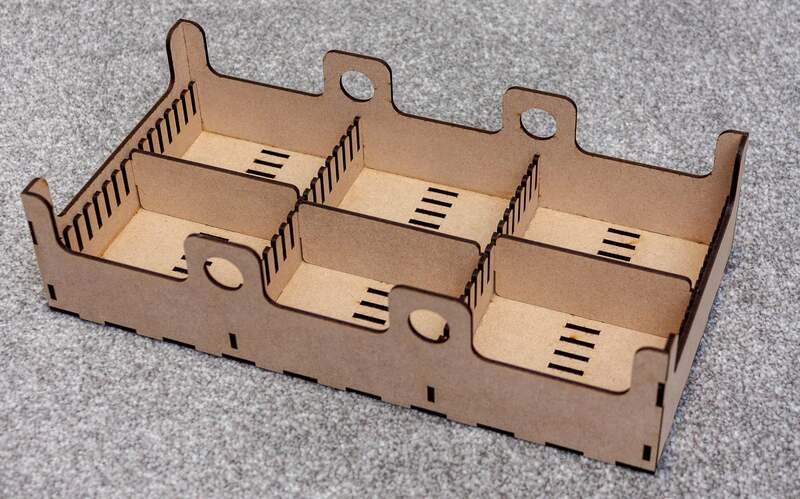 The bottom layer of the insert is made up of four separate trays. 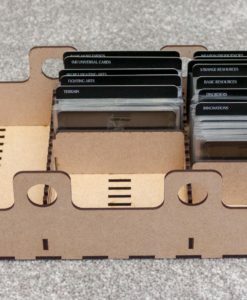 Three of the trays are for the monster game cards, and the other tray is either for gear cards (Option A), or more monster cards (Option B). Each monster card tray comes with six move-able dividers, and the gear card tray comes with eight move-able dividers. 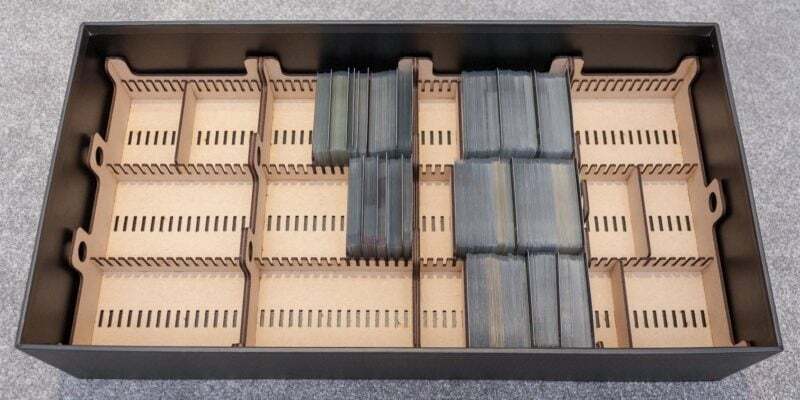 The total available space in the insert is 71mm high, which fits the card dividers provided in the 1.5 core game, however the original expansion dividers are slightly taller, so will need to be cut down slightly, or swapped with our divider sets as appropriate. 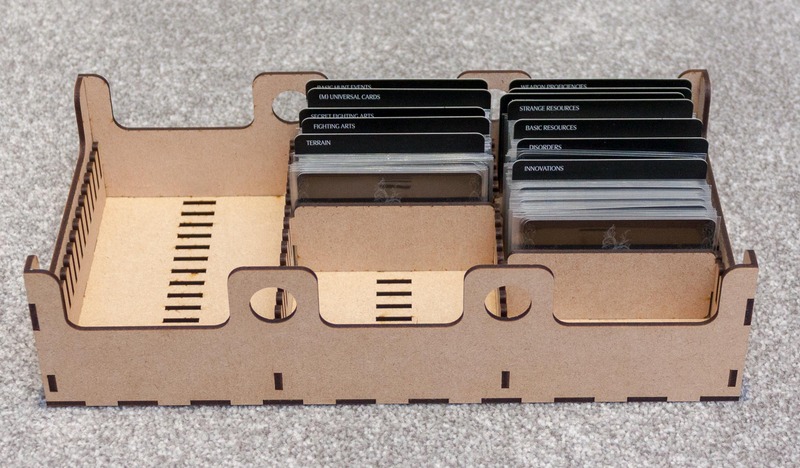 Option A contains three trays for holding the main game cards, and a fourth smaller tray for holding gear cards. 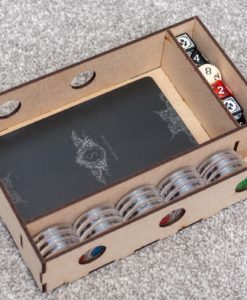 The exact number of cards this holds will vary, depending on the thickness of card sleeves used, but the total space available is 1386mm for monster cards, and 614mm for gear cards. 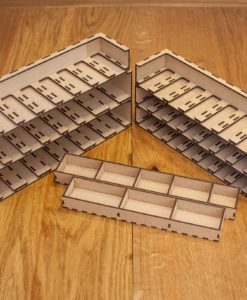 Dividers are optional, and are 3mm thick, a total of 18 dividers for monster cards, and 8 dividers for gear cards are included. 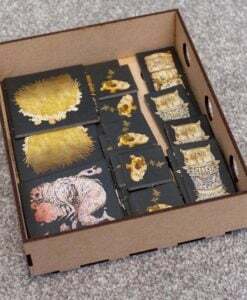 Game contents shown is a version 1.5 Kingdom Death: Monster core game, with large cards sleeved with premium Fantasy Flight Supply sleeves, and gear cards sleeved with regular Swan Panasia sleeves. Option B is intended for gamers who store their gear cards separately to the core game, such as in a ring binder. 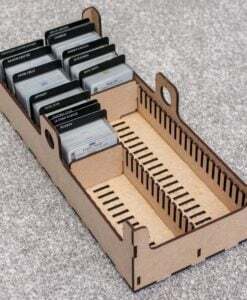 Option B contains four trays for holding the main game cards, with the fourth being slightly smaller than the previous three. 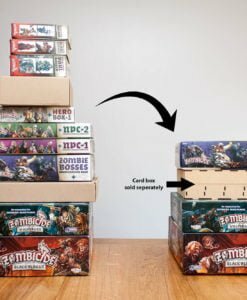 The exact number of cards this holds will vary, depending on the thickness of card sleeves used, but the total space available is 1773mm for monster cards. 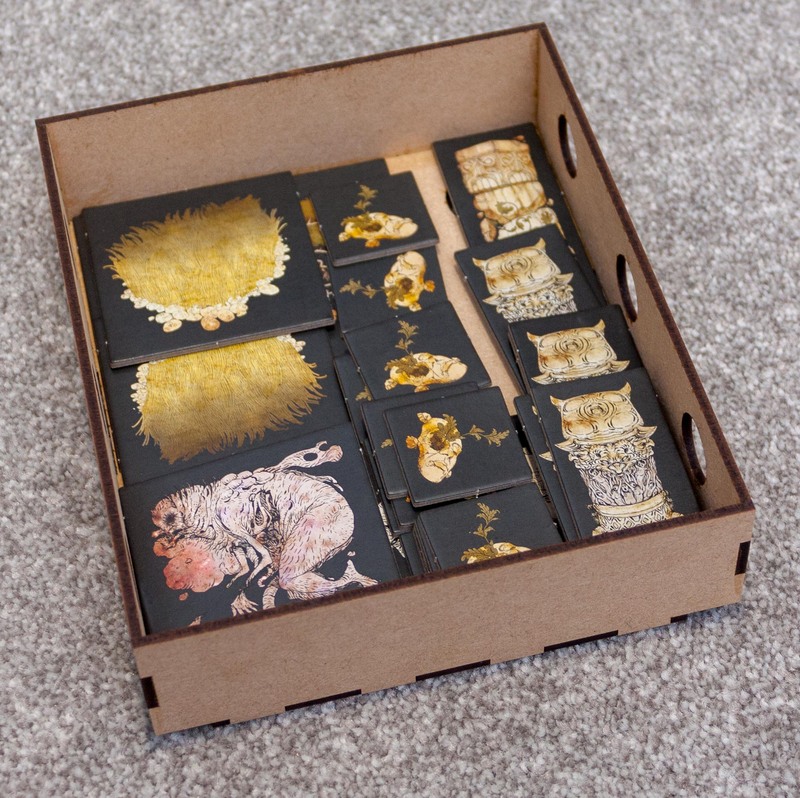 Dividers are optional, and are 3mm thick, a total of 24 dividers for monster cards are included. Game contents shown is a version 1.5 Kingdom Death: Monster core game, with large cards sleeved with premium Fantasy Flight Supply sleeves. 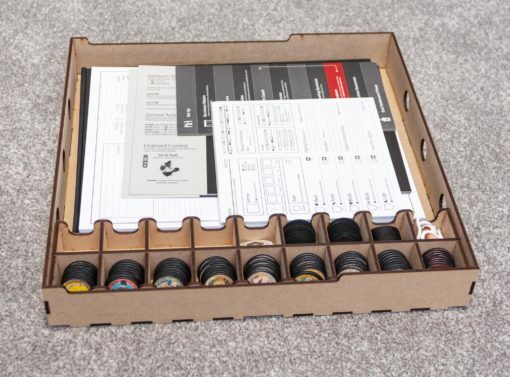 Fits within the original Kingdom Death Monster core box, and adds approximately 2.5kg of weight to the box. 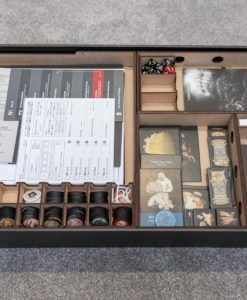 The Kingdom Death: Monster box insert is provided flatpack and will require wood glue (PVA) for assembly. 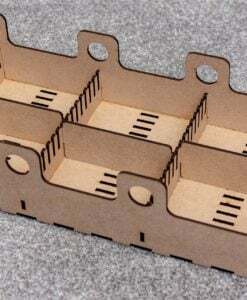 Approximate assembly time is 10-20 minutes per tray depending on complexity. First things first: I love huge games with lots of bits. 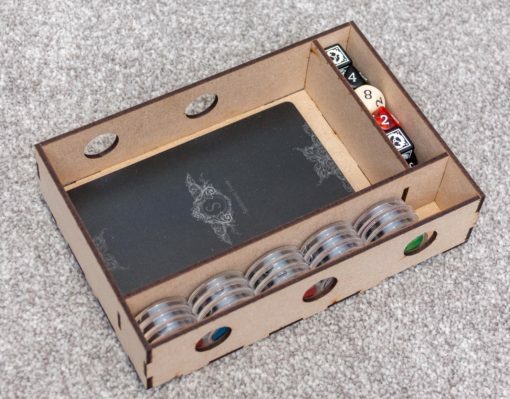 Because of this, I have custom inserts for most of my games and I am always on the lookout for new storage solutions that I don’t have to build from scratch myself. Enter KDM, blowing this whole thing out of proportion. As soon as I received my core game, I started building, sleeving and pimping (I do also get to play 🙂 ). 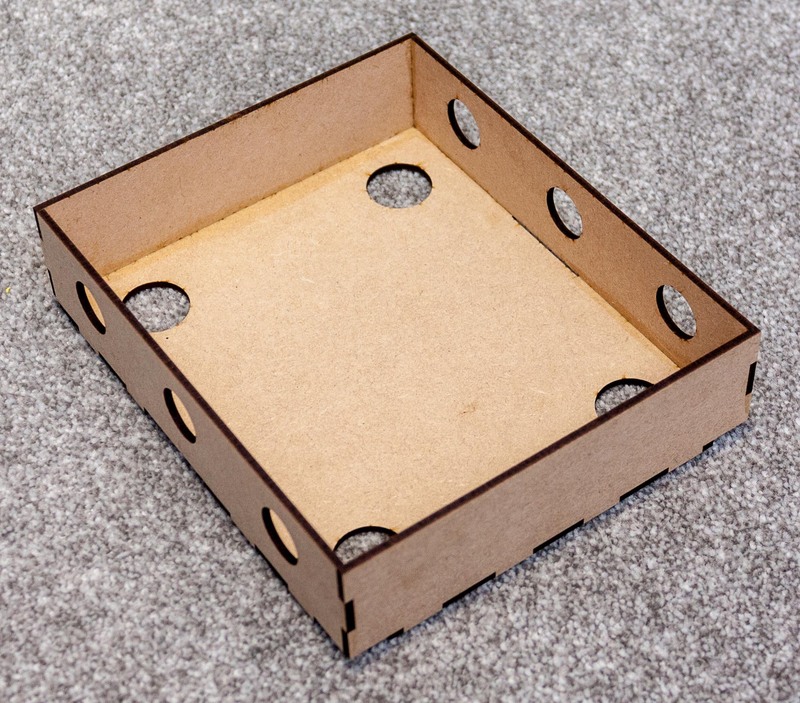 In order to store all components and leave room for current and upcoming expansions, I first bought the Top Down Terrain insert. 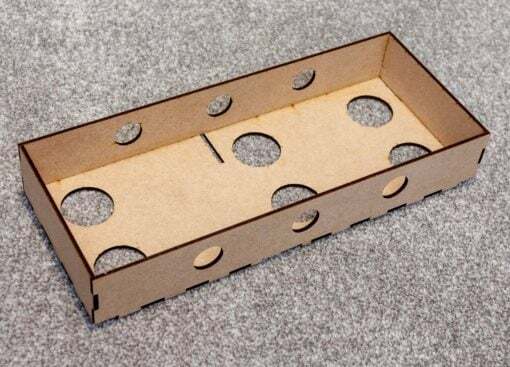 While very functional, some things were a bit odd, design wise. 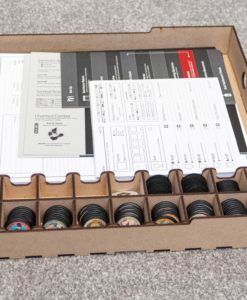 I stumbled upon the Xelaser insert via BGG (had found it myself when looking to pimp my game, but had no need at the time for the other stuff available). Ordered on a Saturday, delivery to Belgium (16 GBP) by Wednesday. Really fast, packing very good! 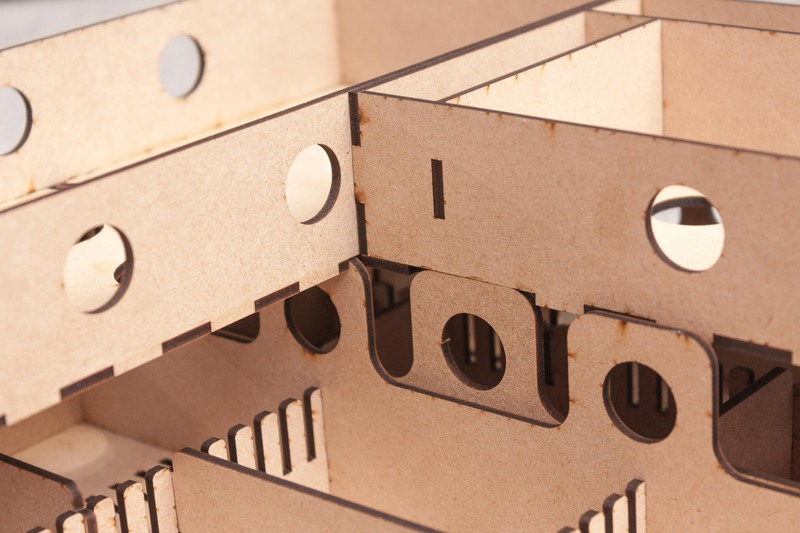 No instructions included, but guidelines etched in the wood sheets. Small criticism here: if you have never put one of these together, it will be a bit difficult. More detailed instructions (even if only online) would be nice. 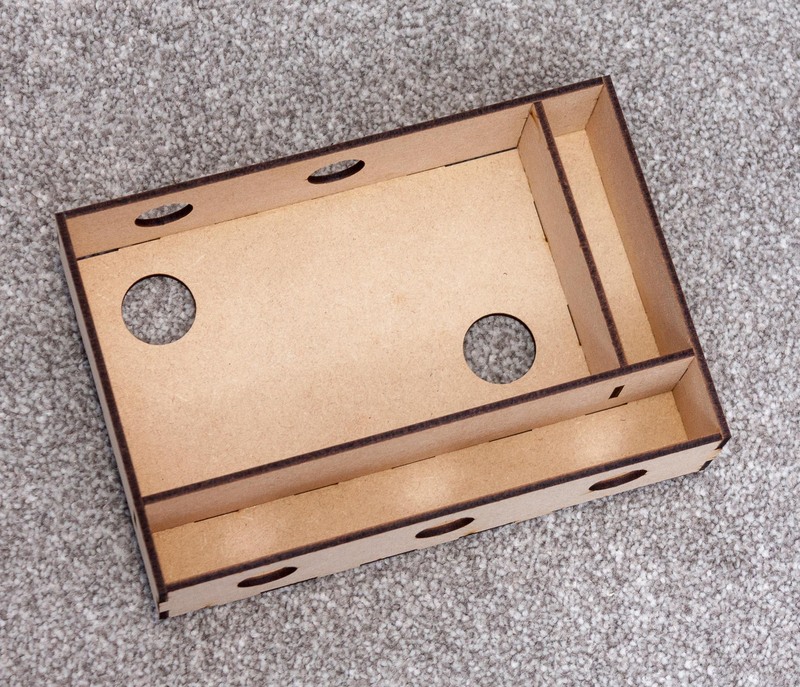 Product quality: although the wood product looks to be the same as what competitors use, it does feel a bit weaker to me. By no means do I mean flimsy or inferior. 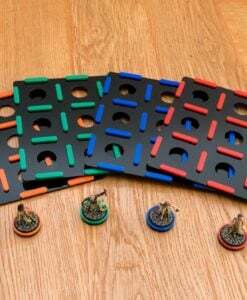 With normal boardgame use it cannot possibly break, trust me! Components: as mentioned, details are etched into the sheets for easier reference. They are cut very well and with little loss of space (resulting in less sheets to be produced and transported). Everything was very easy to remove and dry fit. However: there are some odd design choices here as well. 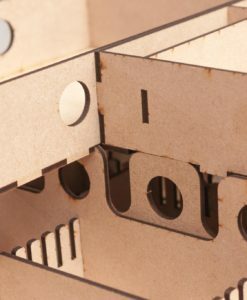 The biggest two being: 1// not a very tight dry fit, making preliminary building without glue difficult and 2// the connections are weird. Now, this is very hard to explain, this means that where you normally have matching puzzle shapes to build your trays, this insert leaves strange holes. This results in less surface to put glue on, thus lessening the build strength. 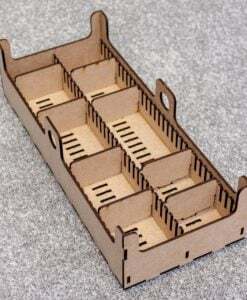 I see this being an issue for the very large paper tray and when getting out full large card trays. Feel like they might break loose when using wood glue. Besides that: wow, this insert is awesome. 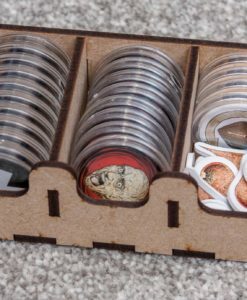 I use coin sleeves, so glad someone actively looked for a solution. I took option 2 for the top tray and option A for the lower tray. Heaps of space left for all current expansions for sure in both gear and large card trays. It also gives you a lot of freedom to organise however you want to do it. I have to rate 4 stars only for the build issues, would like to hear from the creator why this is (just curious) and because 4.5 is not possible :). I would say this is easily the best option currently out there, awesome work (definitely as this only on of their first creations)! Really looking forward to the next projects! 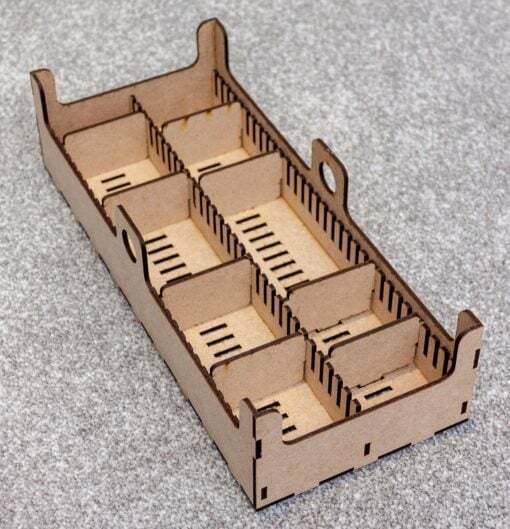 Assembly instructions are available online here, and have always been linked from the ‘Assembly’ section of the product description. We have now tried to make this a bit more prominent, and will add a note to the packing slip in future to mention this as well. 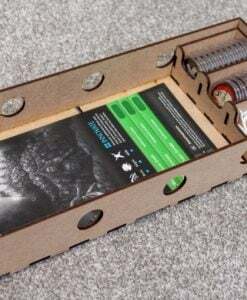 The weird connections are there to create a slot for the top layer to ‘lock’ into the bottom layer of the insert, this way avoids the risk of one of the top trays sliding, falling off its supports and crushing the cards in the layer below. Personally we haven’t seen any strength issues regarding glued joints, in fact, we have failed to break apart some of the prototypes to dispose of them without jumping on them. Thanks again and try not to let your head explode! Easily the best insert kit I have had the pleasure to build up to date. The cuts are perfect and the material has no wrapage at all which makes it a dream to assemble (went though the whole built in under two hours in one sitting, the online assembly guide is easy to understand and helpful). The material quality is vastly superior to anything I own from other established firms that produce inserts. 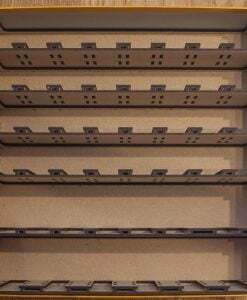 I started by dry fitting the first tray and then.. stopped (which is something I would never have recommended to do on any build up to now) and just began to glue everything without bothering to dry fit first, the cuts really are that precise! You just have to lay out the pieces on a flat surface first to check for the right orientation. Looking forward to future inserts! Excellent quality! Cuts are simply perfect. I had almost assembled everything but I’m planning to paint them with a matte black spray and then apply a soft red velvet on the floor of each insert. After further remarks from Alex (here and on BGG as well), just wanted to upgrade my rating to 5 stars. Managed to fit everything and am very, very happy. Also bought the dividers in the mean time, great addition! Secretly preparing to order the settlement hunt board (only need to convince my wife…). This storage solution is amazing. The only issue I have is the amount of room for the expansion cards. 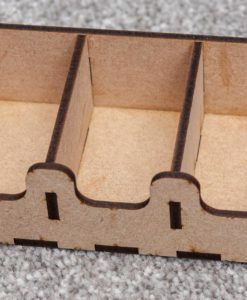 If you pick bottom layer option B, you wont be able to fit all the expansions with wood dividers. 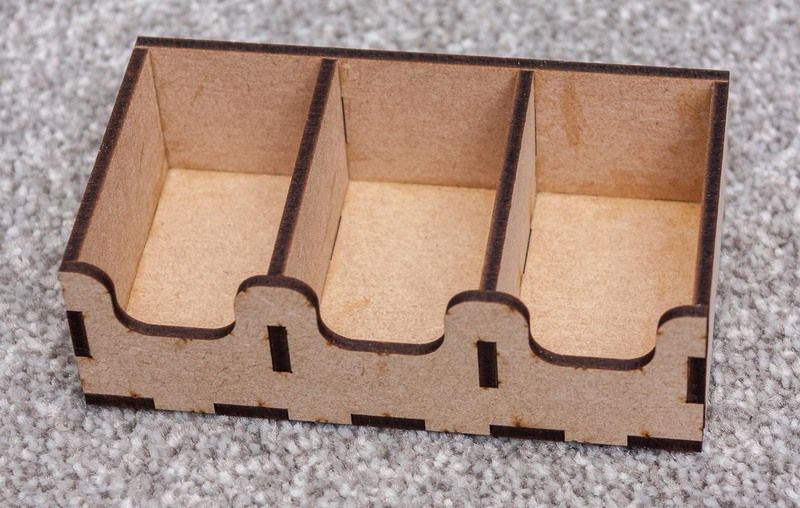 It will however fit all the current expansions without wood dividers. 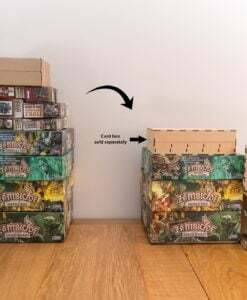 I recommend going with bottom layer option A, if you plan on getting the new expansions in the future and want to use the labeled wood dividers . The flower knight and sun stalker big terrain tiles wont fit in the terrain holder, but they will fit in the notes holder. 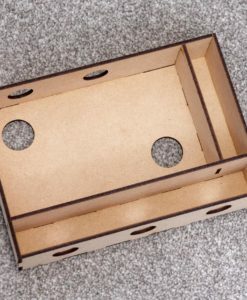 Overall this is easy to assemble and the quality is great.